This dosa recipe is for traditional rice flour pancakes that are typical of what you will find in Indian restaurants. They rise due to allowing the batter to stand for several hours, when they begin to ferment and take on a slightly sour taste. There are natural yeasts, but no added yeast. The fermentation accounts for bubbles you may see. You can skip this if you can’t eat fermented foods, or you just want to make some quick wraps. They are still good. In addition to rice, the other main ingredient is urad dal, or white split gram beans. They are actually black until they are split and the hull is removed. The dal complements the protein in the rice for a nutritious and satisfying pancake. But there are many kinds of dosa recipes, including arisi rava dosai made with just rice, and rava dosai which are made with wheat. So if you are traveling don’t expect all dosai to be wheat free. Masala dosai have a spicy potato filling and are also commonly found in Indian restaurants. In India, both Pattu Dosai and Masala Dosai are popular in Madras coffee houses, or tiffin houses, all over the country. If you are on a gluten free diet you can use the basic dosa recipe to make a great breakfast (without the fenugreek seeds.) Because they are fermented, they are reminiscent of buttermilk pancakes. I like them with fresh fruit, or puréed fruit, but they’re good with any of your favorite toppings or fillings. If you prefer to skip beans at breakfast, you can make the all rice version by omitting the beans and using 1½ C rice flour and 1½ C rice cereal. 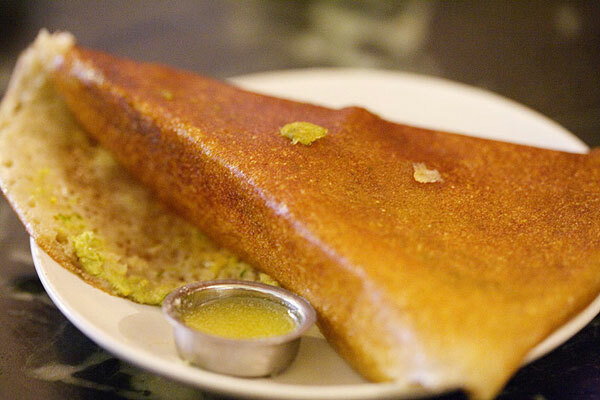 If you try the dosa recipe, please share your comments here. Cover the dal (and fenugreek if using) with water and allow to soak overnight. Drain the dal, rinse and drain again. Use a blender or food processor to blend it with a cup of the hot water until smooth, about 5 minutes. In a large bowl combine the soaked dal, the rice flour, and 2 C hot water, stirring to make a thin batter. Cover and let it stand for at least 5 to 8 hours, up to 12 hours tops. Check the batter: it should be like a thin crêpe batter, slightly sour smelling and tasting. It should be light and foamy. If it’s too thick add some water so it will spread easily. Stir in the salt and baking soda if using. Heat a large griddle or 10 inch pan over medium-high heat and lightly oil it with a paper towel, leaving no excess oil. Cook about 2 minutes until browned, then flip and cook another minute until done. Optional:To make authentic crispy edges, after the crepe has set pour 1 to 2 teaspoons of oil around the edges before turning. Stack the dosas as you remove them from the pan, cover, and keep them in a warm oven. Be sure to stir the batter before cooking each dosa, as it tends to separate. I adapted this dosa recipe from Classic Indian Vegetarian and Grain Cooking by Julie Sahni, and Flatbreads & Flavors: A Baker's Atlas by Jeffrey Alford and Naomi Duguid. Both are wonderful resources. For an easier version of dosas, sign up for my newsletter and get my easy gluten free recipes for free. I recommend using a finely ground flour for the dosa recipe, in order to get the silky smoothness that is characteristic of Indian dosas. Authentic foods carries a superfine white rice flour , and a superfine brown rice flour, if you prefer whole grains. I prefer to use brown rice flour, and most of the stuff you get is rather gritty. So if you want silkiness and whole grain, you may want to try the Authentic Foods, and let us know what you think. I haven’t had a chance to try it yet. Another option is to go to an Indian or Asian market to get fine rice flour.